March 5 @ 2 PM: "Race?" Race is a term fraught with contradiction and incoherence. Is race skin color? Physiology? Susceptibility to certain diseases? Geographic origin? Genetic variation? The impress of climate on body? Born or made? A bodily, ethical, legal, cultural or moral state? An inheritance? A performance? Scientifically speaking, race does not exist … and yet race endures. Please join us for a GW MEMSI symposium examining the long history of race. 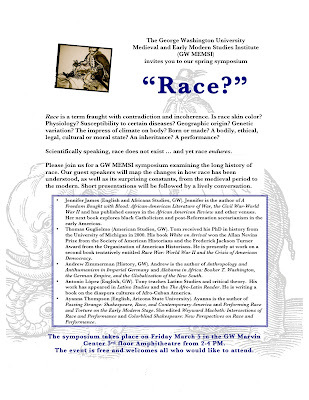 Our guest speakers will map the changes in how race has been understood, as well as its surprising constants, from the medieval period to the modern. Short presentations will be followed by a lively conversation. Jennifer James (English and Africana Studies, GW). Jennifer is the author of A Freedom Bought with Blood: African-American Literature of War, the Civil War-World War II and has published essays in the African American Review and other venues. Her next book explores black Catholicism and post-Reformation sectarianism in the early Americas. Thomas Guglielmo (American Studies, GW). Tom received his PhD in history from the University of Michigan in 2000. His book White on Arrival won the Allan Nevins Prize from the Society of American Historians and the Frederick Jackson Turner Award from the Organization of American Historians. He is presently at work on a second book tentatively entitled Race War: World War II and the Crisis of American Democracy. Andrew Zimmerman (History, GW). Andrew is the author of Anthropology and Antihumanism in Imperial Germany and Alabama in Africa: Booker T. Washington, the German Empire, and the Globalization of the New South. Antonio López (English, GW). Tony teaches Latino Studies and critical theory. His work has appeared in Latino Studies and the The Afro-Latin Reader. He is writing a book on the diaspora cultures of Afro-Cuban America. Ayanna Thompson (English, Arizona State University). Ayanna is the author of Passing Strange: Shakespeare, Race, and Contemporary America and Performing Race and Torture on the Early Modern Stage. She edited Weyward Macbeth: Intersections of Race and Performance and Colorblind Shakespeare: New Perspectives on Race and Performance. The symposium takes place on Friday March 5 in the GW Marvin Center 3rd floor Amphitheatre from 2-4 PM. The event is free and welcomes all who would like to attend. 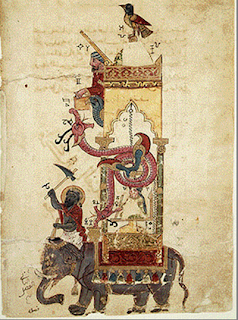 ... we feel compelled to offer you this picture of the amazing Al-Jazari Elephant Clock. Can you spot the "wooden robots in traditional Arabian attire"? Both the Orienting Europe seminar and the Michelle Warren Gateway Lecture on "The Postcolonial Past" will take place today (Friday February 12). The GW campus is open as usual. Seminar at 1 PM in Rome 771; lecture at 4 PM in Marvin Center Elliot Room 310. Click on the links above for details. “Medievalism and the Making of Nations.” Medievalisms in the Postcolonial World: The Idea of “The Middle Ages” Outside Europe. Ed. Nadia Altschul and Kathleen Davis. Baltimore: The Johns Hopkins University Press, 2009. 286-98. Postcolonial Moves: Medieval through Modern, co-editor with Patricia Clare Ingham. New York: Palgrave Macmillan, 2003. History on the Edge: Excalibur and the Borders of Britain, 1100-1300. 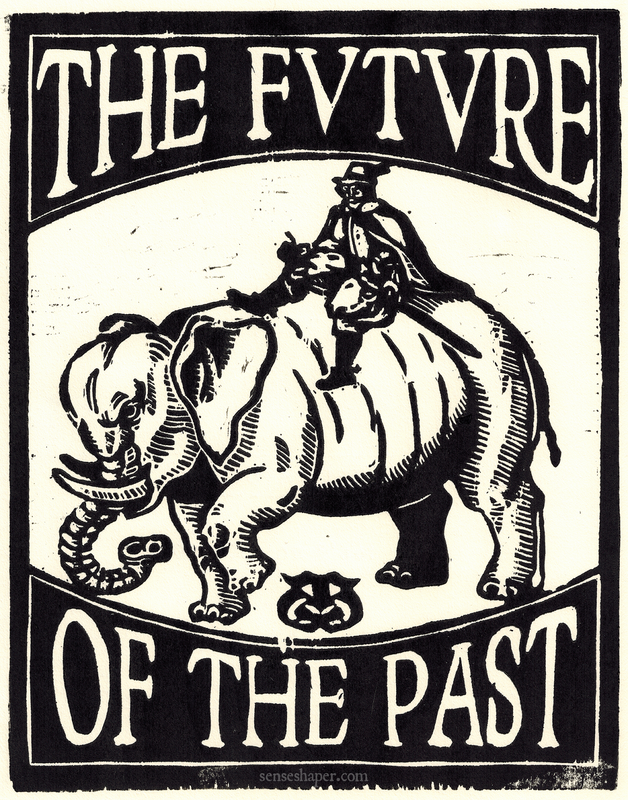 Minneapolis: University of Minnesota Press, 2000. Her current projects include Creole Medievalism (the role of colonialism in the formation of French medieval studies, focused on the Réunionnais writer Joseph Bédier); Making Furs, Making Romance (literary culture in early fifteenth-century London, centered on the translation of French romances sponsored by the Skinners' Guild); and Courting Empire (regional poetics in the works of Chrétien de Troyes). More information about her scholarship and research interests may be found at her Dartmouth website. 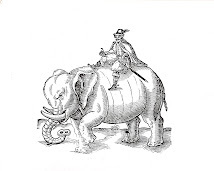 In preparation for "The Postcolonial Past," two articles are available here for download: "The Noise of Roland" (Exemplaria 16.2 2004) and “Au commencement était l'île: The Colonial Formation of Joseph Bédier’s Chanson de Roland.” Postcolonial Approaches to the European Middle Ages: Translating Cultures. Ed. Ananya J. Kabir and Deanne M. Williams. Cambridge: Cambridge UP, 2005. 205-26. 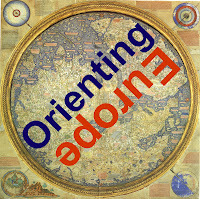 Please join us on Friday February 12 from 1-3 PM for our seminar on "Orienting Europe." Ashley Denham Busse, "Veiled Fantasies and the Fantasy of the Veil in Lady Mary Wortley Montagu's Turkish Embassy Letters." Jessica Frazier, "French Fashion on the Turkish Carpet: Philip Massinger’s Glitterati"
Jennifer Wood, "Musical Dis-Orientations in Shakespeare’s Tempest and Jean de Léry’s History of a Voyage to the Land of Brazil"
The seminar takes place in Rome 771 (Academic Center, 801 22nd St NW). Also join us at 4 PM for Michelle Warren's Gateway Lecture, "The Postcolonial Past" (Marvin Center Elliott Room 310, 800 21st Street, NW).